So, after a lot of disasters, which included many batches of hot cross rocks! I finally managed to produce a batch of edible buns! These were created for a PR agency who are trying to promote the use of rye flour. I’m not afraid of carbohydrates in the diet and spend quite a lot of time sticking up for the health benefits of including this food group in the diet. I don’t mean promoting the consumption of sugary drinks and mars bars, but the inclusion of small amounts of good quality wholegrain foods that add valuable fibre, B vitamins, magnesium and iron to the diet. We don’t need a huge amount of carbohydrate in the diet and what you need can be manipulated based on your health goals. If you’re a healthy weight and very active, training hard, then they’re a valuable source of immediate energy in the form of glucose (the body’s preferred source of energy), that helps to prevent fatigue by storing glycogen in the muscles and liver. However, overloading the body with carbohydrate foods as well as leading an inactive lifestyle, will lead to weight gain and if you’re trying to lose weight then cutting back is a useful tactic given the fat storage effect of insulin. Limiting carbohydrates in the diet to no more that 50g per day, which equates to 2 slices of bread or 200g of cooked wholegrain pasta, rice or quinoa, can force the body into utilising fat stores as an energy source (a process called ketosis). You don’t want to remain in this state indefinitely, but studies show ketogenic diets are an effective way to reduce body fat and ultimately overall body weight. Foods made using rye flour such as pumpernickel are a good choice of carbohydrate given their high fibre content. Most people don’t eat enough fibre and this nutrient has been shown to protect against heart disease and bowel cancer as well as helping to control blood sugar levels and maintain fullness between meals. Rye is also a good source of magnesium, iron , zinc, manganese and copper as well as B vitamins such as thiamin, riboflavin and B6, which are all essential for the conversion of food into energy used by cells as well as maintaining healthy skin and nervous system. Rye is also wheat-free, although not suitable for coeliacs or those with gluten sensitivity as it still contains gluten. Whilst there are a significant number of people who experience bloating and digestive upset when they eat too much wheat, a diagnosed allergy is very rare. The most dangerous form of wheat allergy occurs in people after exercising within a few hours of eating these foods. Exercise-induced changes in the body either trigger an allergic reaction or worsen the immune response to a wheat protein. This condition normally results in life-threatening anaphylaxis. 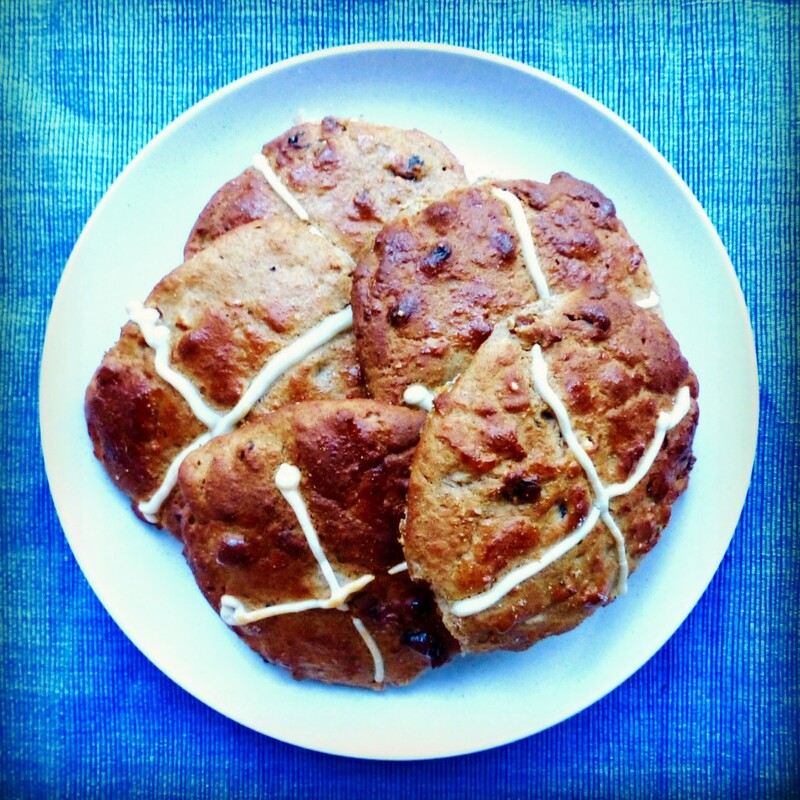 These hot cross buns are made using rye and gluten-free flours. They’re not as fluffy and light as your usual hot cross buns and fail to rise in the same way but still taste great. I also like the homemade look of these hot cross buns! You can play around with the ingredients and experiment with different flavours such as cranberry and orange or ginger and apple. I have switched the caster sugar in this recipe for honey (still a sugar but with more depth of flavour) and used less of it so they contain about half the sugar of traditional shop-bought buns. Adding in dried fruit and walnuts helps to boost the nutritional content of the buns although they should still be seen as a sweet treat. The best way to enjoy them is toasted with a little butter. I have no problem with using butter as it’s a much more natural food (and tastier) than chemically produced margarines that are high in omega 6. Although butter is high in saturated fat, we are now beginning to question the effect on health (especially heart health) of foods naturally high in this type of fat, although it’s still high in calories so you need to go easy! Grease two large baking sheets and lightly dust with rye flour. Add the flours, salt and spices to a large bowl and combine. Add the butter and rub into the flour mixture until it resembles fine breadcrumbs. Stir in the yeast the add the milk, eggs and honey then beat with a wooden spoon until the batter is smooth. Stir in the apples, sultanas and walnuts until evenly dispersed. Use a tablespoon and drop the mixture onto the baking sheets making sure each one is widely spaced. Use a knife dipped in water to shape each one into a round shape. Cover each of the baking sheets with greased cling film and leave somewhere warm to rise for 40 minutes until doubled in size and small holes appear on the surface. Remove the cling film. In a small bowl combine 100g gluten-free flour with 2 tbsp of water to form a thick paste. Transfer to a piping bag and pipe crosses on the buns. Place the baking sheets in the centre of the oven and cook for 30 minutes. They will not rise like a usual hot cross bun as they have been made using rye and gluten-free flours. Once cooked transfer to a wire rack. In a small bowl, combine a little honey and water then brush lightly over each bun whilst still hot to create a glaze. This entry was posted in Breakfast, Nutritious Delicious, Recipies and tagged breakfast, hot cross buns, Nutrition, rye flour, wheat free. Bookmark the permalink.